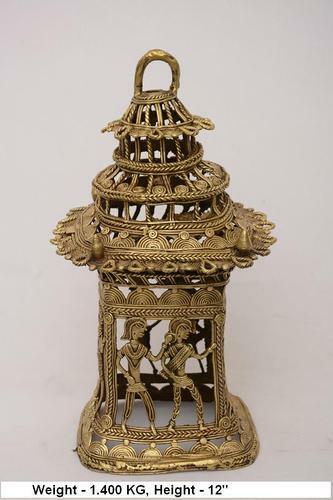 Brass Decorative Lamp are 100% handmade using lost wax technique and is believed to be the oldest craft in India.Material used is brass.Craft name -Dhokra Craft which is the folk craft / tribal craft of Chhattisgarh, India. We, Bastar Arts started in the years 1996, are one of the foremost Manufacturer, Exporter, Wholesaler, and Retailer of a comprehensive consignment of Brass and Metal Statue. Our offered range consists of best grade Brass Nandi Statue, Brass Elephant Statue, Award Mementos, Brass Horse Statue and much more. Designed by the use of excellent quality inputs, these are available in several size and design as per the requirements of customers. Owing to their high strength, durability, fine finishing, and sturdy structure, this statue ranges are highly appreciated among our patrons. Our state-of-the-art infrastructure unit has new technology machines. This helps us to cater the bulk requirements of our prestigious patrons. Together with this, we have a team of talented professionals which work dedicatedly to provide our patrons with a quality approved product range which is in compliance with the client’s given specifications. Also, we deliver brass and metal statue range within the assured time frame. Apart from this, the customized option is offered, keeping the ease of our patrons in mind.